Bulger, an ex-boxer turned journalist, lied his way into Baker's life by claiming he was a writer for Rolling Stone. 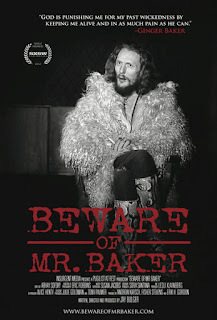 He moved in for a time with Baker, eventually placing an article in Rolling Stone (“Ginger Baker: Still Making Enemies”). He then proceeded to make this film, an intimate, appropriately percussive, imaginatively illustrated life history of this singular, almost supernatural musical icon. Bulger shows us that profiling Baker was no task for sissies: the camera captures the moment when Baker, enraged at Bulger's plans to interview people from his past, attacked Bulger with his cane (“I'm going to put you in hospital!”), breaking his nose. With compelling autobiographical narration by Baker, detailed interviews of Baker's family members, former friends and collaborators, and a battalion of famous rock drummers, including Nick Mason, Carmen Appice, Stewart Copeland, Neal Peart and Mickey Hart, the film vividly demonstrates that Baker is an unbelievably gifted musician and a decidedly awful human being. After an hour and a half of superb live music footage driven by Baker's thrilling, superhuman rhythms, you might conclude that the “awful” part doesn't matter so very much, unless you are one of Baker's badly treated children, former wives or unfortunate collaborators. His temper, however, was perhaps a gift from his dad, who died in World War II when Ginger (real name Peter Edward) was a boy. Dad left a letter to be read by Ginger at age 14. It advised Ginger to use his fists when necessary – “they're your best pals sometimes.” The boy took the advice to heart, proceeding to fight back against bullies, and later to hit and stomp anyone who got in his way or disagreed with him, such as his collaborator/nemesis Jack Bruce, Cream's bassist. Young Ginger (so called for his red hair) fell in love early with jazz records, Max Roach and others, while serving as a decoy while his friends shoplifted from a record shop. His enduring love is for jazz, a field in which real drumming skill is valued; though he earned his fame in rock bands, being a rock icon never satisfied him. His introduction to jazz drumming was also his introduction to two things that were later important in his life: the incomparable rhythms of African drumming, which fellow musicians played for him, and heroin, the drug of choice among jazzmen. Later in his career, Baker held a series of “drum battles” with several of his percussion heroes: Buddy Miles, Elvin Jones, Phil Seaman, Art Blakey. He was exhilarated to be regarded as a member of their elite class. The film complements Baker's autobiographical narrative with graphic novel-style illustrations, some showing Baker's peripatetic movements across the globe – he had a habit of picking up and leaving locations, marriages, bands and situation impulsively. Each location he leaves is shown on an illustrated map as aflame, another bridge Ginger has burned. In the '70s, Baker moved to Nigeria and began playing with legendary Afrobeat bandleader Fela Kuti. He was the first musician to discover and immerse himself in Africa and its music, not just importing African musicians but living in squalid conditions among the locals .Following six years of fantastic music-making, he left Africa after falling in love with the game of polo and falling out with Fela. While the movie doesn't cover all of Baker's impressive later work (the 1986 Horses and Trees, his trio with Charlie Haden and Bill Frisell), it's a thorough, thrilling look at a difficult and superbly talented man and musician. Was it worth getting one's nose broken for? It would seem so! 4 out of 4 stars.